Detox your skin from the effects of grime and pollution with this rich creamy Face Wash with citrus extracts of mandarin & anti-oxidant Vitamin C, leaving your skin feeling fresh and sparkling clean. Experience the quenching ability of Watermelon and Muskmelon extracts with this face wash that rehydrates every pore while the natural luffa fruit fibres gently brush away impurities. 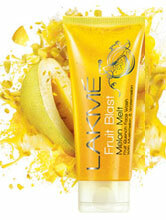 So your skin stays tingling fresh with the fragrance of natural melons. 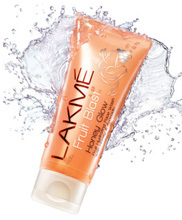 Lakme Fruit Blast Honey Glow Fruit Hydrating Face Wash with Honey and Avocado is specially designed for winters to deep cleanse your skin without robbing its essential moisture with Honey & Avocado extracts this rich creamy face wash gently cleanses, deep hydrates and conditions skin keeping your skin feeling soft, smooth and supple all day through. Squeeze a small amount into hands and work into a rich lather with a little water. Massage on wet face. Rinse thoroughly with water. Use twice daily, in the morning and in the evening. 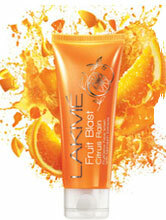 For best results top up with Lakme Fruit Moisture Honey & Avocado Winter Perfect Day Creme SPF 9. For external use only.